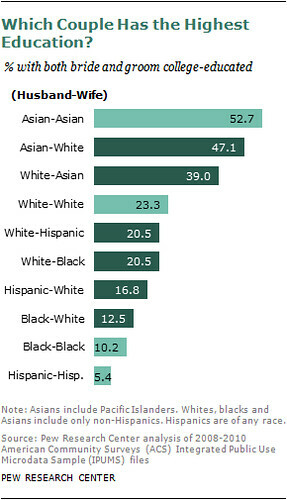 White husbands and Asian-America wives make slightly less, but are still the second highest paring. Interesting, right? Asian-Asian couples are more likely to both be college-educated than Asian-white couples, but the difference is small. What’s more interesting is the disparity between Asian-white and white-Asian couples. 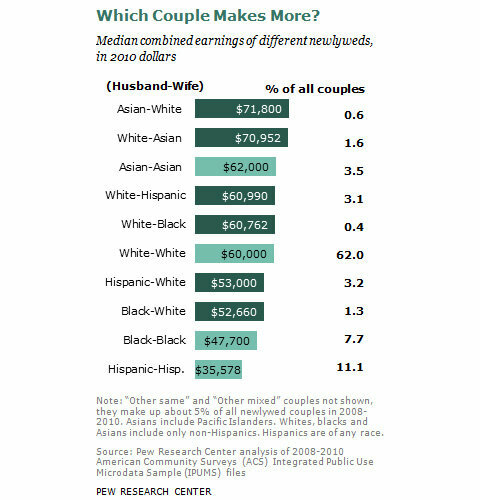 It’s possible that this explains interracial couples with an Asian husband’s higher incomes: couples where the husband is Asian and the wife white tend to be higher educated, perhaps accounting for Asian-white couples’ slightly higher incomes. This suggests that Asian-white couples are more likely to have met in college than white-Asian parings, possibly because highly-educated women are less likely to marry a less-educated partner.